You can thank my sister for this post. I have been feeling dramatically uninspired of late, hence the radio silence. And then my sister sent me a lovely email, which included a link to one of my blog posts from 4 years ago, about her trip to Iceland. And somehow it’s inspired me. 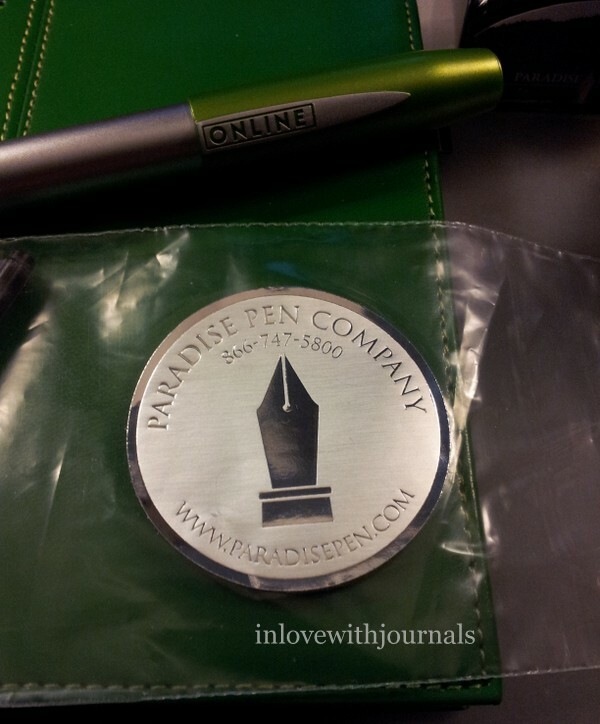 There’s alot of change afoot in the stationery/fountain pen world. 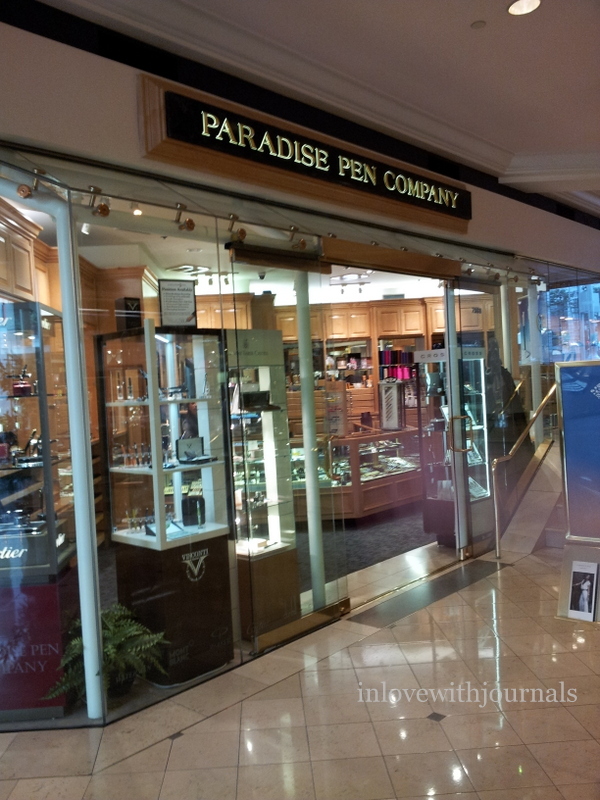 Wonderpens have closed one shop and opened another; I so love their blog I felt I was saying goodbye too, even though I’ve never set foot in any of their stores to date. Matt Armstrong of The Pen Habit on YouTube has ended his run as fountain pen/ink reviewer extraordinaire. Believe me, I can relate. I seriously considered shutting this whole thing down. Even Mary at From the Pen Cup took a long breather between posts. I’ve set myself the challenge of 53 posts this year, which may or may not happen. And I’ve decided to be at peace with that. 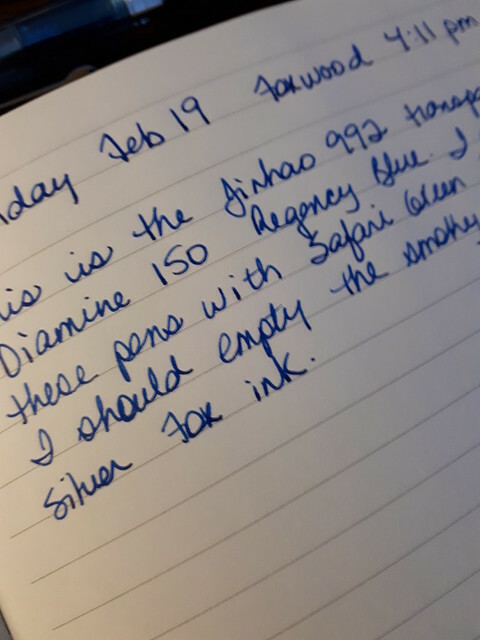 So inspired by my sister I’m going to review the Lamy Al-Star Pacific 2017 Limited Edition fountain pen she gave me for my birthday last year. 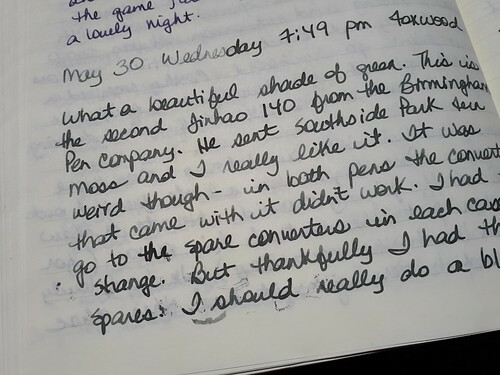 It’s my third Lamy; I’ve written about the Safari and my other Al-Star previously. The Safari was one of my first purchases after starting the blog, back in 2012. And the Al-Star was a Christmas present in 2014. 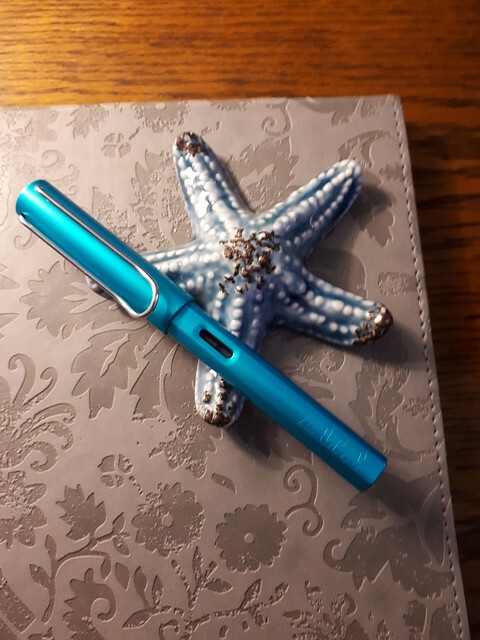 This Lamy Al-Star is a gorgeous turquoise blue, called the Pacific, for the colour resembles tropical seas. 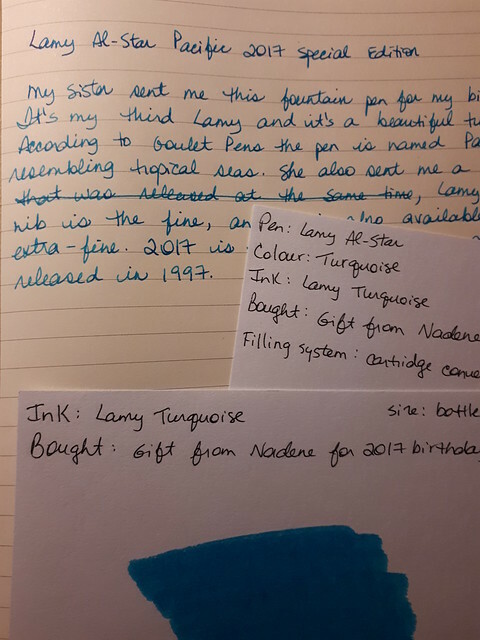 I also received a bottle of Lamy Turquoise. 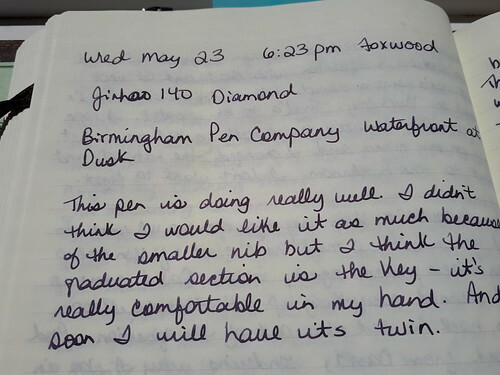 It was released with the special edition pen but as far as I can tell it’s the same colour as the old Lamy Turquoise. Either way it’s a glorious colour. The nib is fine and very smooth. 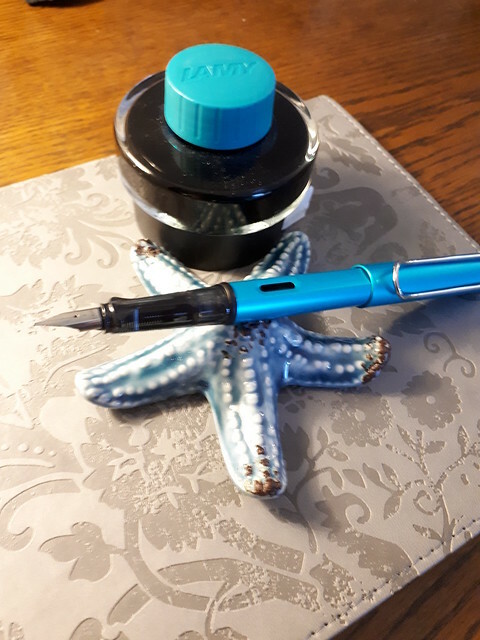 Since last September I’ve had it inked up with the Lamy Turquoise, and it always starts writing the instant the cap comes off, with no skipping or hard starts. The cap posts securely although I would advise caution with posting, as my purple Al-Star is showing signs of wear on the barrel. The distinctive triangular section, unique to Lamy, creates a strong grip for long writing sessions. The Al-Star usually retails for just under $40 US. The 2017 special edition is no longer available on Goulet Pens; indeed it has been replaced by the 2018 special edition in Vibrant Pink. I’m told the Al-Star Blue Green is very close in tone to the Pacific. But I did manage to find two on offer on Amazon as used. I highly recommend the Lamy Al-Star, for beginners and pros alike. 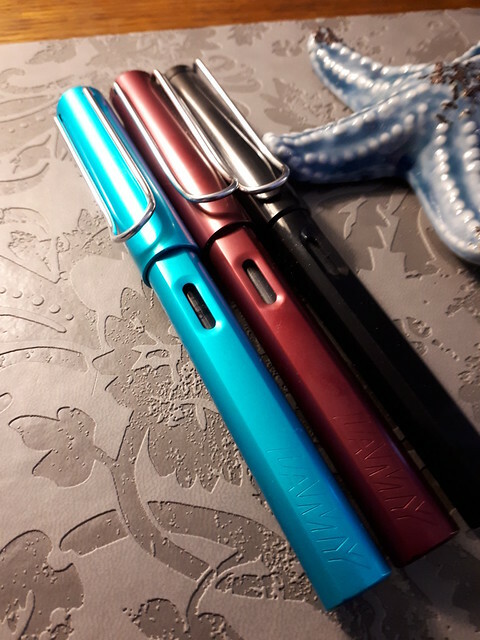 These special editions are a fun way to expand your Lamy collection – such colours! And finally today (in North America) is the day we honour our mothers. Today marks my 18th Mother’s Day without mine. I wish I could say it gets easier. But some years are better than others. I have a wonderful mother-in-law who receives our well wishes via video call. And now that I’m back in Nova Scotia I can visit my grandmother’s grave, and honour her memory along with her daughter’s. 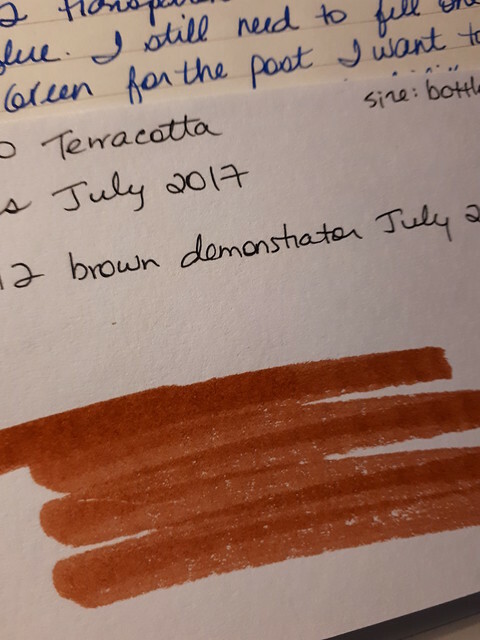 I’ve been thinking for some time about changing the way I record the details of my pens and inks, as discussed in this post. I love having lots of room to write about each pen or ink, but inevitably I found the binder too large and heavy to be practical and portable. So I’ve made the move to index cards. I’ve made a list of all the pens I have, as well as a list of all the inks. 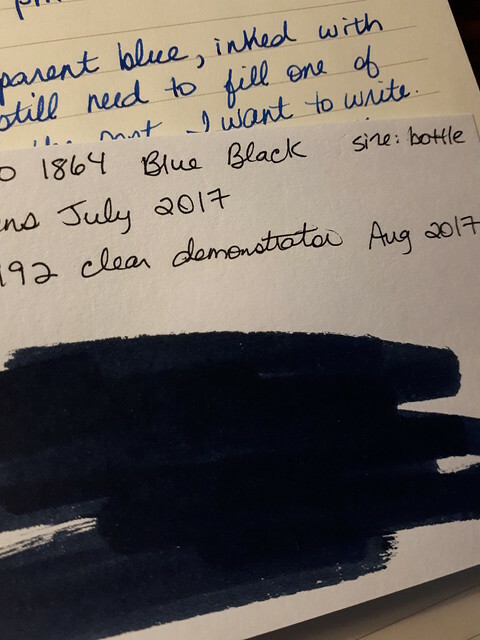 I’ve noted down the colour of pen, the size of bottle, where each was purchased and when. 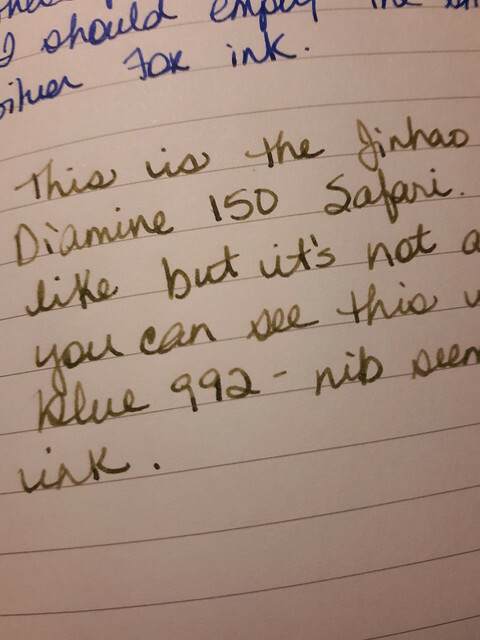 Then each pen and each ink has it’s own index card under the corresponding letter (J for Jinhao and D for Diamine). It’s compact and alphabetical. It’s still a work in progress as I haven’t found a proper file drawer for it; I would love to purchase a real library file drawer (with the steel rod and everything!!) but my budget doesn’t allow it at this time. I plan on doing a full post on it when it is finished. 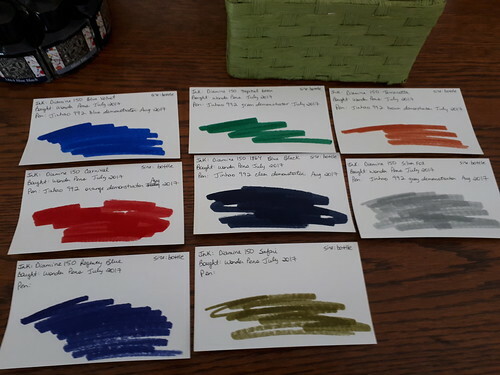 But in working on transferring the contents of the binder to the cards I have found gaps in my inventory, and one such obvious gap is a set of inks I bought after the binder was set up but still packed away: 8 of the Diamine 150 Anniversary Inks. 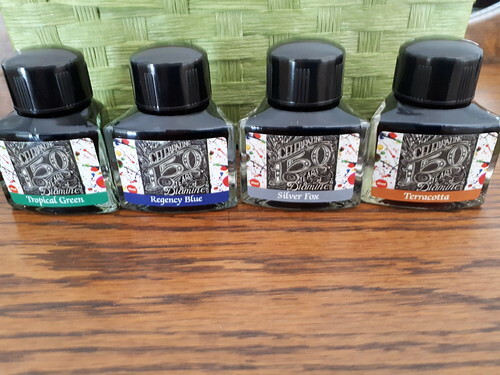 To mark the 150th anniversary of its brand, Diamine released 16 40 ml bottles in a unique triangular shape that, when arranged, form a beautiful carousel of ink. I have eight of these, and I actually didn’t realize there were eight more until I did the research for this post. 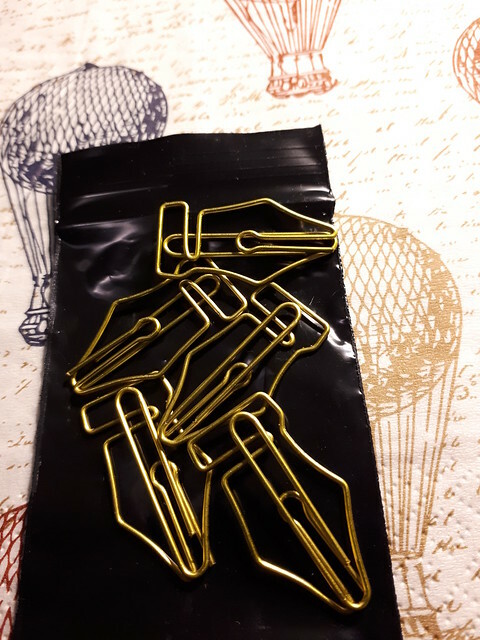 I bought the set from WonderPens.ca and they gave me a deal because I bought a set of eight. Now that I know there are eight more, I might ask them if they would offer me the deal again! When I have a few pennies to spare maybe. You can buy them on the Wonderpens site for $15 each. The labels are very distinctive, with the swirly 150 and the vintage feel. 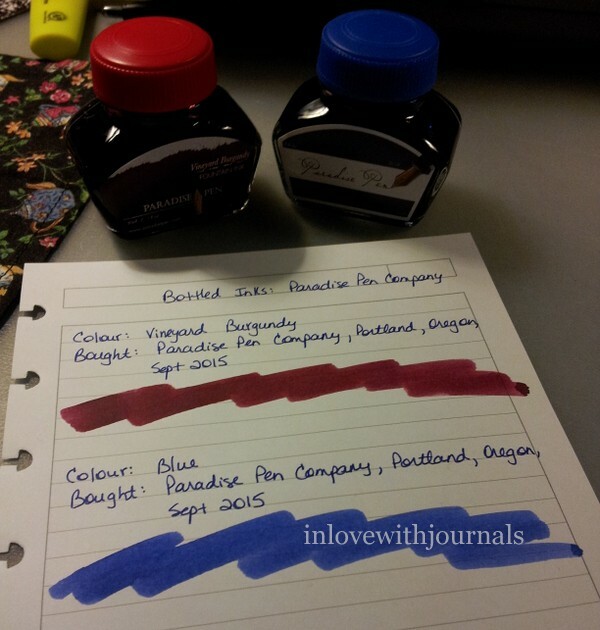 And the inks themselves, as with all Diamine inks, are bright and eye catching. Here is the Blue Velvet. 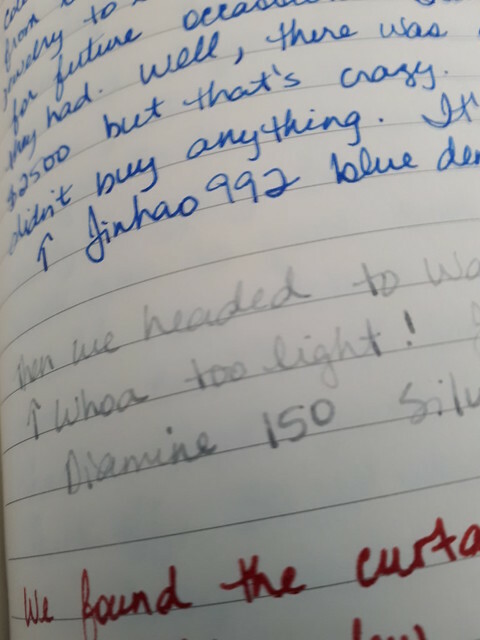 The blue handwriting in the photo above is from my journal, made with a Jinhao 992 pen inked with Blue Velvet. Here is Carnival, which is more of a true red than what is coming through in the photo. 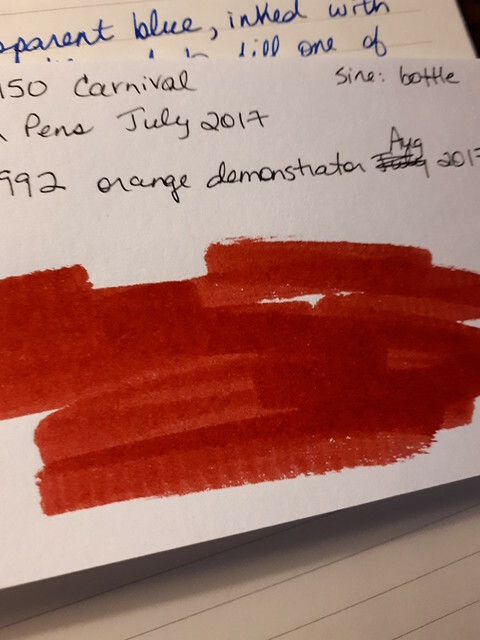 Here the red writing is in Carnival. 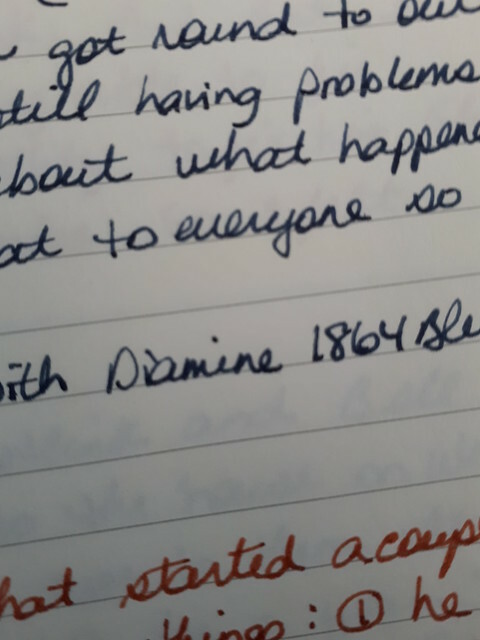 Here is the 1864 Blue Black above with a writing sample below. 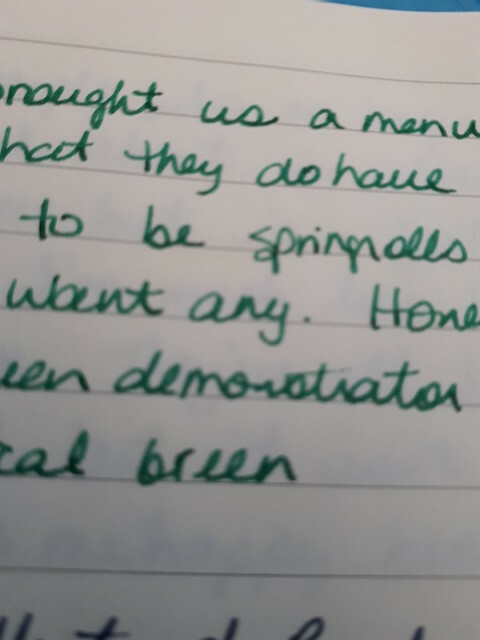 Above is the Safari green, with a writing sample below. 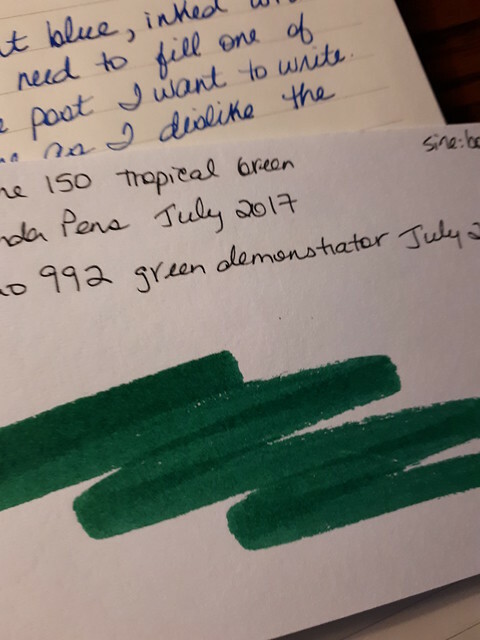 Here is the Tropical Green with a writing sample below. Love this green. 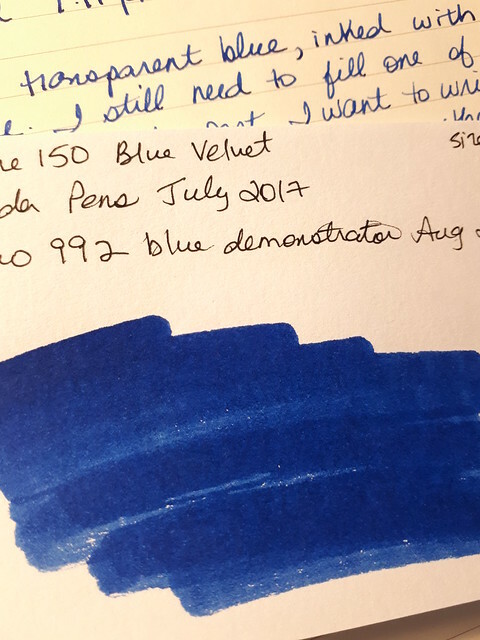 Here is the Regency Blue followed by a writing sample. 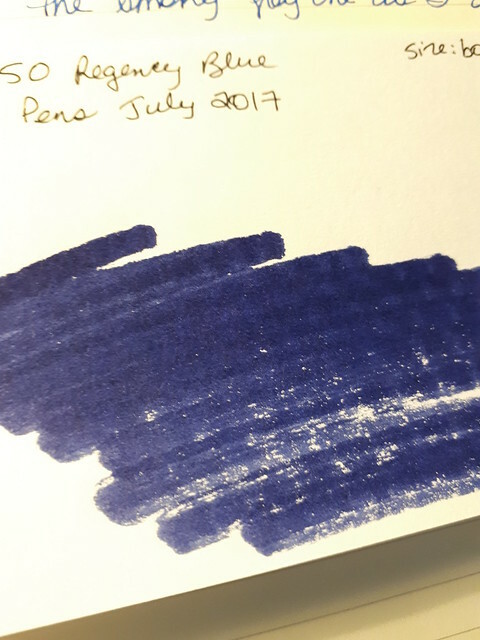 I like all three but this is my favourite of the blue inks in this set. Here is the Silver Fox with a writing sample following. This is my least favourite of this set. 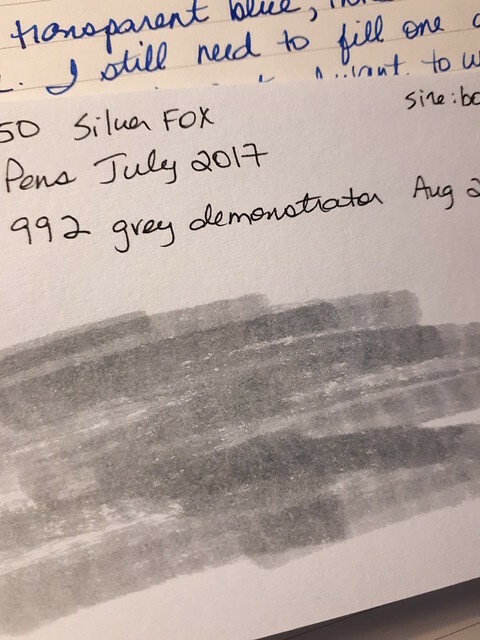 I have never come across a grey ink that I like; they all seem to be too light. You can barely read this one. And finally here is the Terracotta, with the writing sample following. 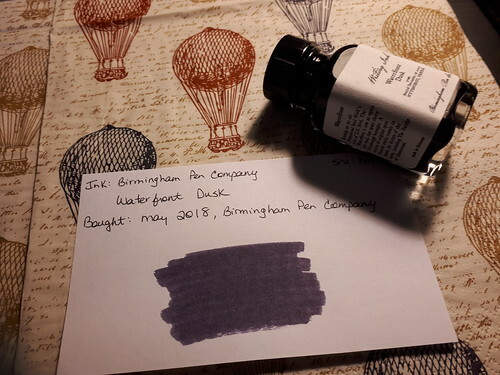 That’s it for the Diamine 150 inks, or at least half of them. 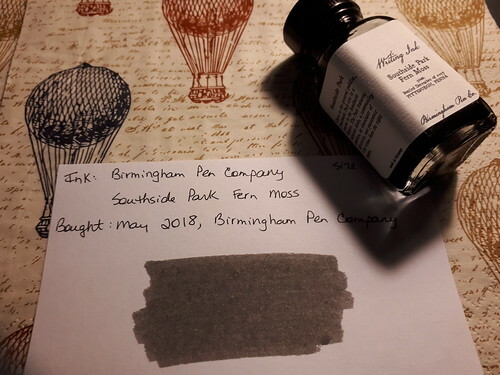 I also came across a few more new inks that need to be reviewed but this post is certainly long enough so I won’t inflict them on you. Yet. 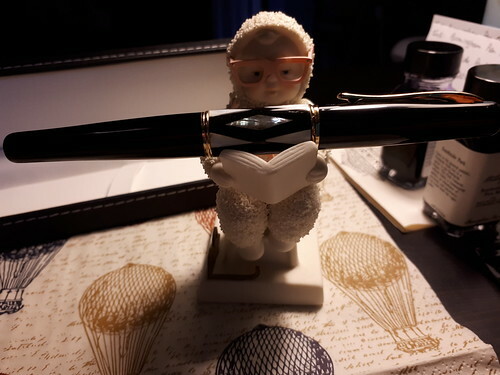 In June I saw a review of the Waterman Kultur on YouTube by Jennifer of Best Fountain Pen. She was so enthusiastic about it I had to check Amazon and sure enough it was available in Canada too. So I picked up two: the blue and the red. I have a Waterman pen already; you might remember my vintage Waterman Junior. But as a vintage pen it’s delicate and I always worry when I use it. I wanted a Waterman I could use every day and throw into my bag. And I didn’t want to spend a ton of money. So when I saw this beauty and Jennifer’s excellent review I knew I had to have one. Or two. The nib is advertised as a fine but it writes more like a medium. 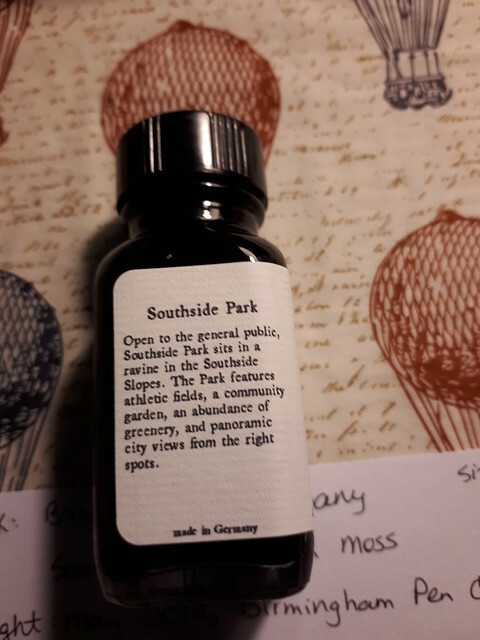 Very smooth writer right out of the packaging. These pens do not come wit a converter but the cartridge supplied with the pen has a bigger ink capacity than any converter anyway. These are demonstrator pens, meaning most of the pen is transparent so you can see the inner workings. The section is especially fascinating as the ink comes in. The plastic body makes it light in the hand, perfect for long writing sessions. The cap is a pull and snap cap so no threads on the fingers. There is a tiny step down on the section but I didn’t find it bothering me as I wrote. 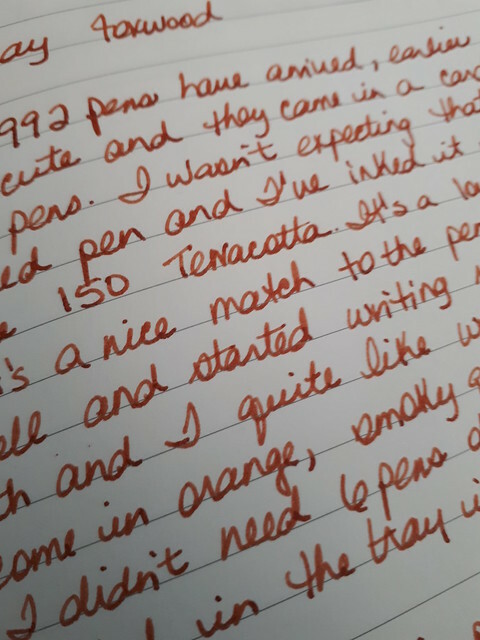 I’m very happy with this pen. 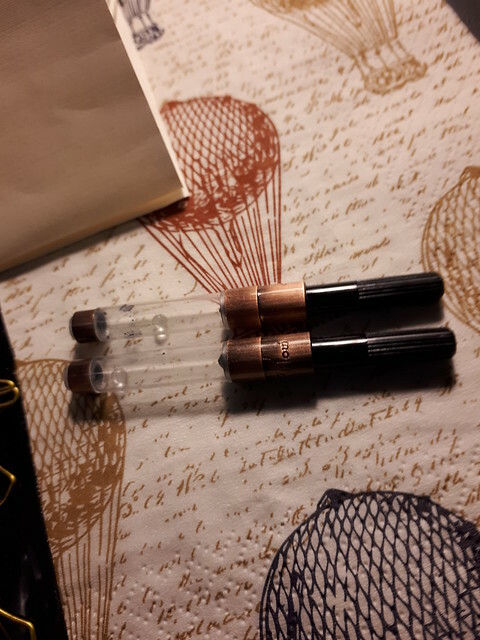 I haven’t opened the red one yet; I recently bought some Waterman Audacious Red and once I have an empty cartridge when the blue one runs out I will fill it with the red. 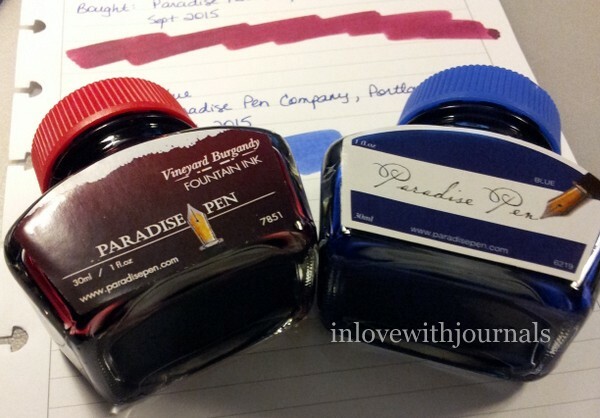 Audacious Red is the last colour of Waterman ink that I needed to complete the set. Love it! Love them all! Audacious Red and Serenity Blue. Tender Purple and Inspired Blue. You can tell I use these two the most. I have a bottle of Inspired Blue at my desk at work too! Intense Black, Mysterious Blue, Harmonious Green and Absolute Brown. 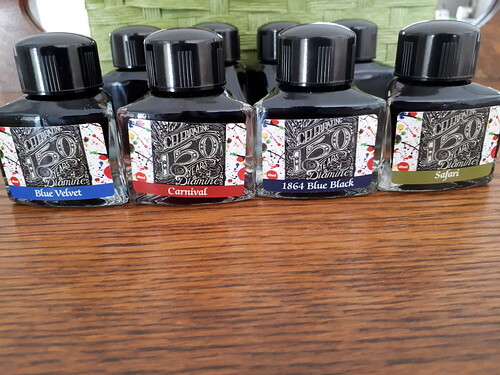 Great inks for your pens. Amazon still has a few of these pens at great prices. 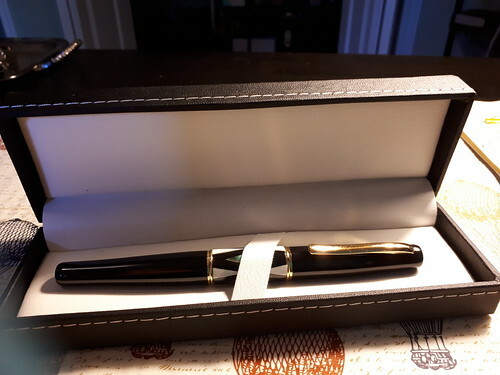 I understand Waterman has discontinued the model which is a shame. If you have a chance to check out the Kultur, do so! Hello everyone! I am back, finally. The move is, essentially, over. Some aspects of our lives have unfolded beautifully in our new home, others disastrously. I am married to the most hard working, patient, incredible man who would be a world Tetris champion based on his POD packing skills! And our two fur babies were absolute angels as they navigated moves from a plane to an apartment to an hotel and then another apartment (remember I said some aspects disastrous, and that’s only one!) So now I am very happy to be digitally connected once again, and grateful to anyone who might still be reading! Before I left Calgary I added something to my writing gear. As you may have heard the world celebrated the 400th anniversary of Shakespeare’s birth/death this year, on April 23. 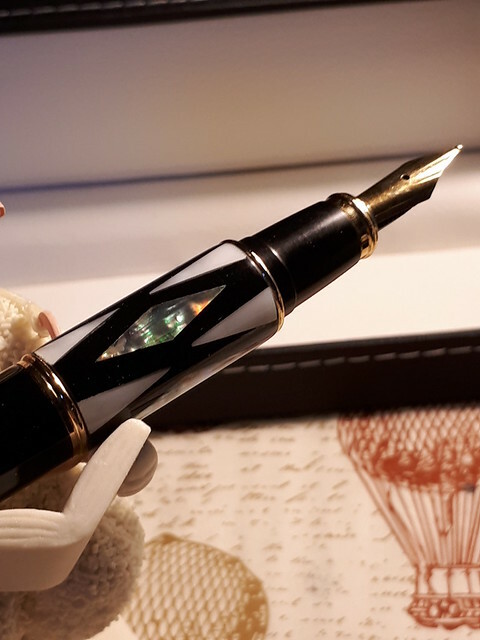 While I could not fly to England to participate in any of the exciting celebrations planned throughout this year, I was inspired by a regular email from Pen Heaven to purchase a pewter feather quill pen with holder and ink bottle. I had it sent to my new office and it was waiting for me when I arrived. Such a nice welcome present! Someday I hope to visit the Pen Heaven store in London. The set is made in Italy and the packaging is gorgeous. The inside is gorgeous too. I chose the brown feather and I love how ornate the base looks. 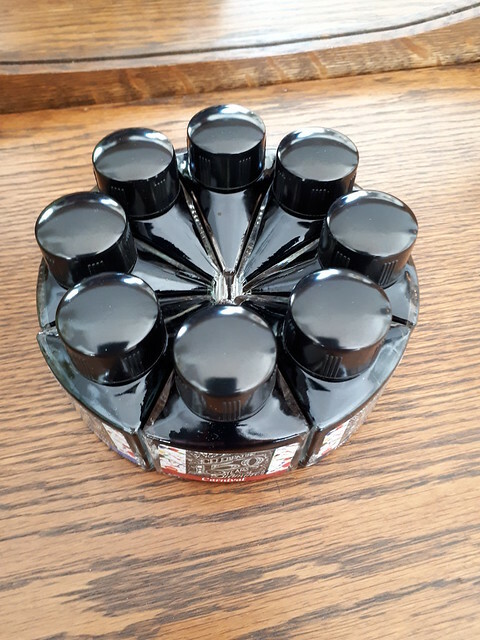 The bottle of ink fits into the holder as well. And there is some literature on the history of quill pens and how to write with one. I thought it would look really stunning on my desk. 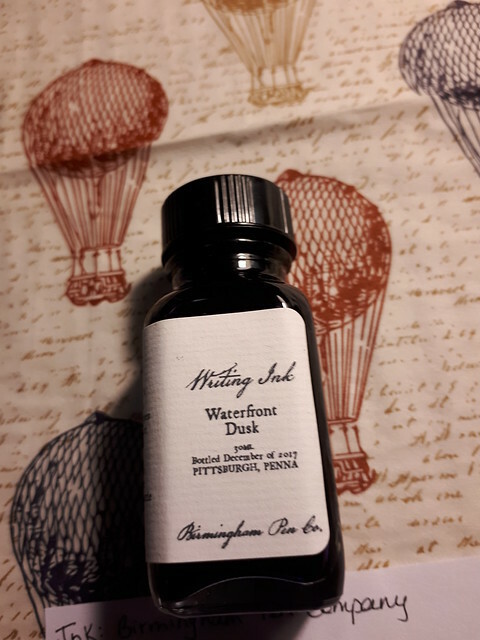 The ink bottle contains black ink and the bottle says Inchiostro Stylografico NERO La Kaligraphica Made in Italy. According to Google Translate this means Black Ink Stylografico La Kaligraphica. 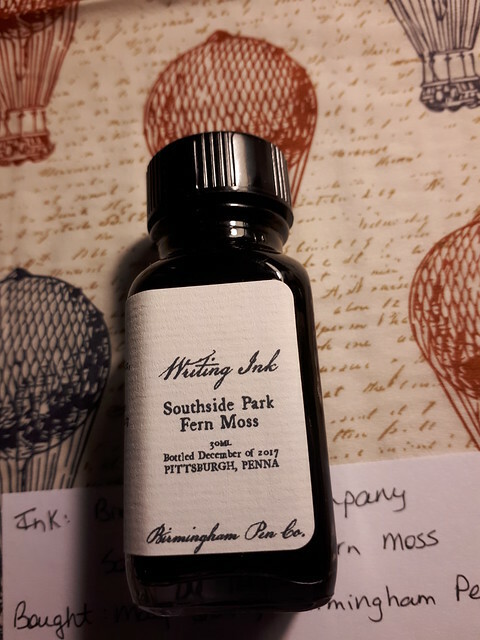 I’m sure this is calligraphy ink and not meant for regular fountain pens. Here’s a closeup of the base and holder. 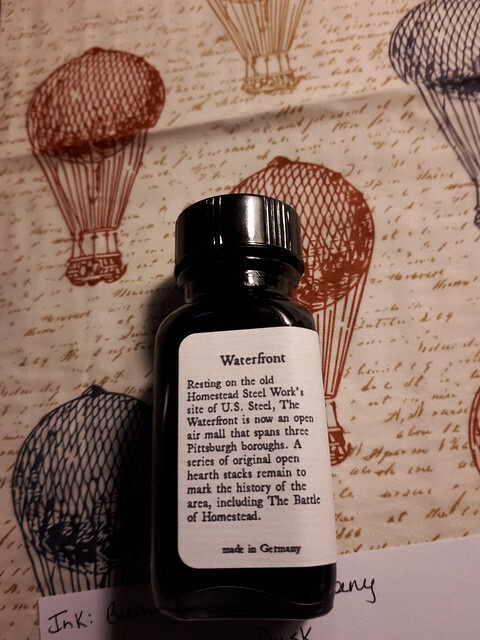 The ink bottle was wax sealed. I think it’s extremely good craftsmanship for the price. 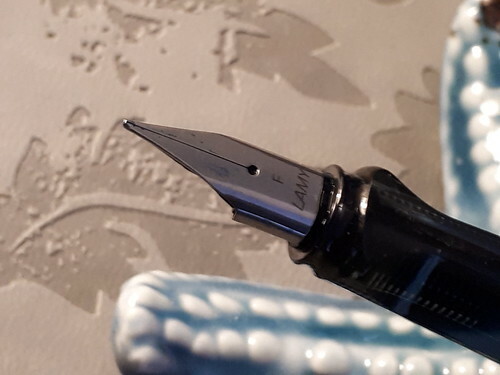 I just realized I didn’t take a photo of the nib but you can see it magnified on the Pen Heaven page referenced above. The ink is a true coal black. 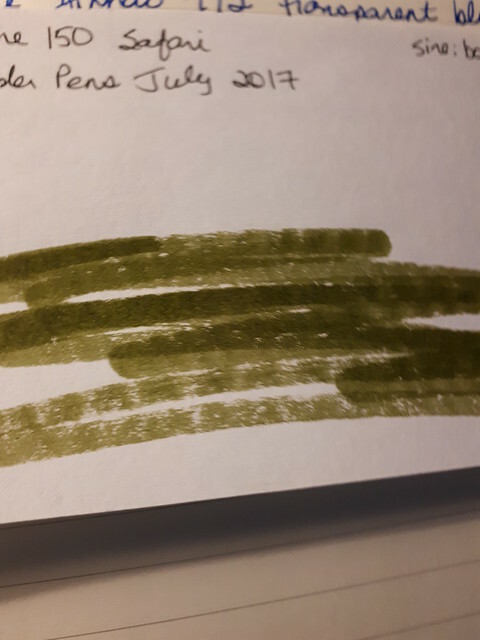 I will have to perfect my technique; the first line came out beautifully but then I had difficulty with the rest with ink blobs and running out of ink. 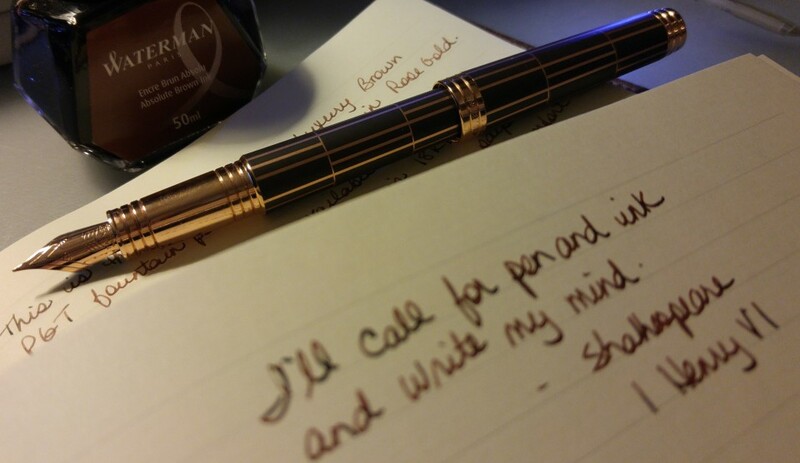 Even if the pen turns out to be more decorative than useful I still love it. I’m sure when my desk arrives it will look great in the corner. Hopefully that will be next week! It feels good to be back online and writing these posts again. I’m not sure if I will keep the same schedule as before; I’m working longer hours and my set up is much different. We’ll have to see how I get on. Until next time, whenever that is, thank you for your patience, thank you for sticking around and happy journaling! I was running out of space in my last Ink Journal so I decided to create a new one. And this time it is housed in a binder instead of an ARC Journal. Lots of room to expand! 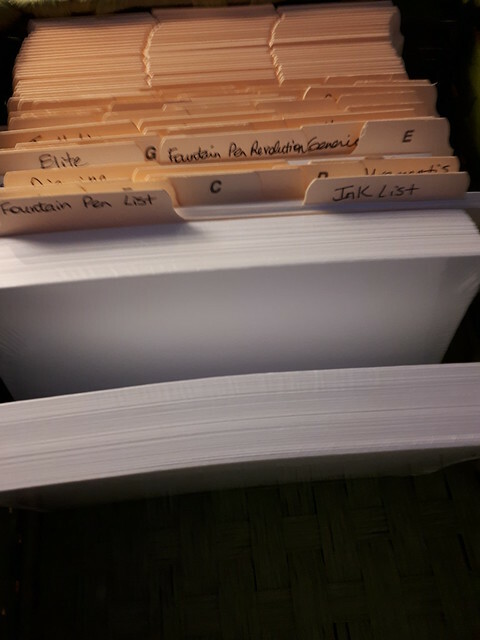 I chose a plain white binder with a clear pocket on the front. I put in some spare scrapbooking paper. I really like how it turned out. 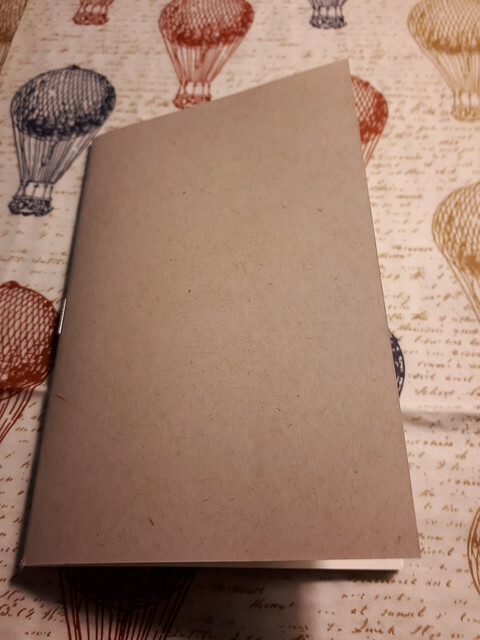 I used the scrapbook paper as dividers inside the binder as well. 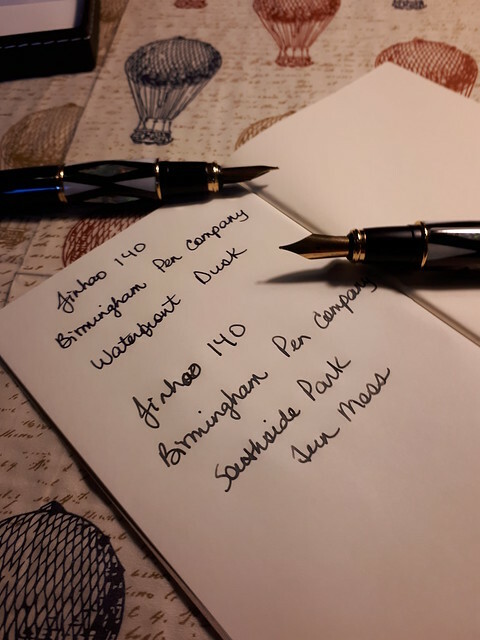 My pen list. I add to it as new pens come in, obviously, and make note when I give a pen away. And I do the same with the ink list. I generally use my Pilot Plumix to write the lists. A colourful index. 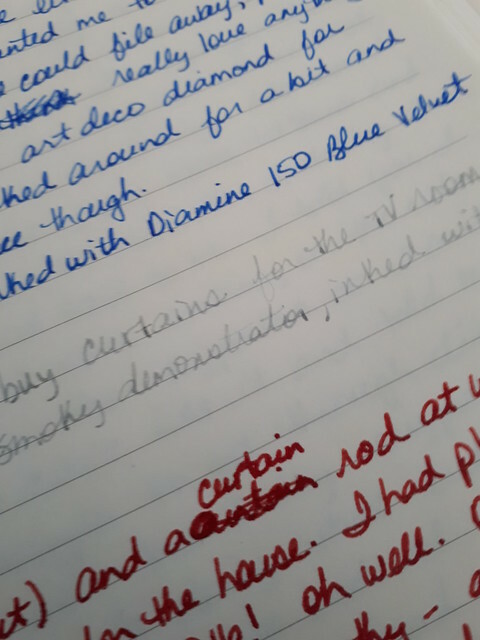 I decided to combined the pens and inks in this section, and simply go alphabetical. So Delta pens and De Atramentis ink will be in the same section: D.
I used puffy alphabet stickers to mark each division. The index goes up to 31 so not sure what I will use the extra sections for yet. I have quite a few empty page protectors so I’ve filled them with pen and ink “stuff”. Here are the paper booklet, serial number and sleeve from my Delta Journal. And here I’ve put in some flattened Waterman boxes. Alot easier to store this way and I like seeing the colourful boxes. 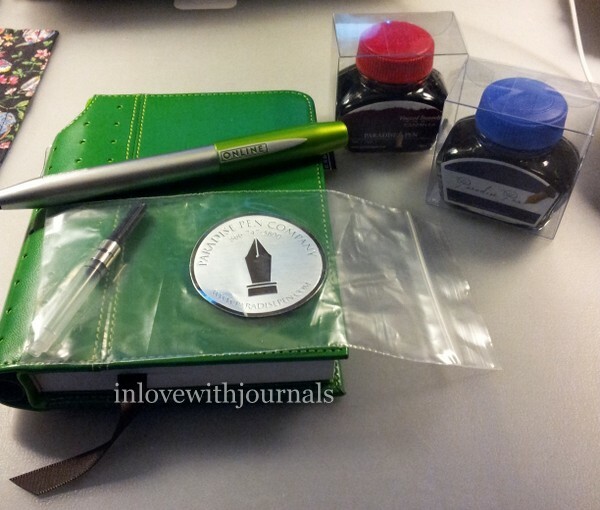 So that’s a quick tour of my new pen and ink journal. 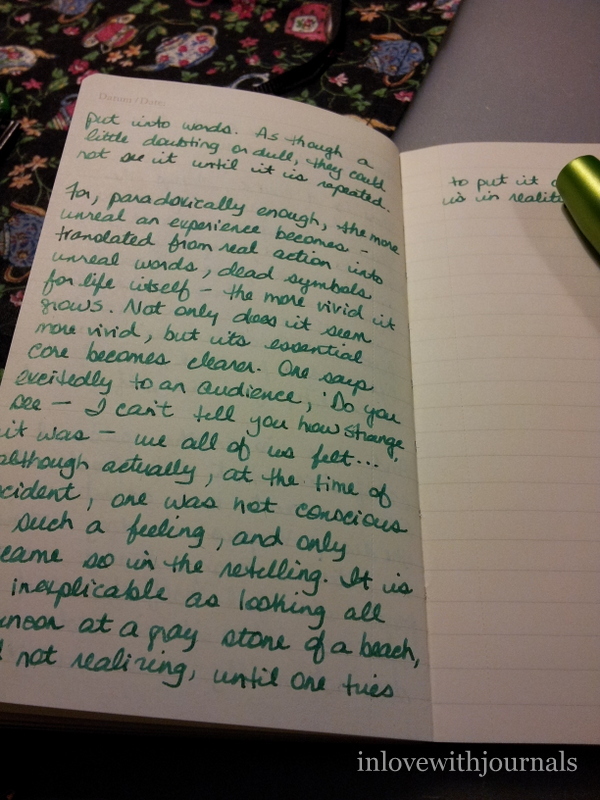 Saying goodbye to the ARC notebook was sad but I’ve simply outgrown it. I will have to find another use for it because it is one of my favorite in the ARC range. Let me know in the comments how you keep track of your pens and inks.